While the kerosene lanterns manufacturers covered earlier on the website such as World-Light, Glory Metal Works, Union Metal Works and Chung Mei Manufactory had all exited the business, another key player in the business – Lea Hin – remains in the business in HK and Southeast Asia after over eight decades of operations since its founding in 1935 in Singapore by Woo Kai Lea (胡嘉烈, 1911-1977). Known for its “Butterfly”, “Tingkwon”, “Eye” and “Star” brands, Lea Hin began making kerosene stoves, pressure oil tanks and burners in addition to pressure lanterns in HK in the 1950s. A native of Ningbo, Woo Kai Lea was born into a family of merchants with his grandfather Woo Kai-tai(胡開泰) being the manager of an old and established sauce factory by the name of Feng Hang Tai (馮恆大) in Cixi (慈溪,near Ningbo) for decades and many relatives worked there as well including Woo’s father and brothers. When he graduated from primary school in 1924, his grandfather decided to send him to Singapore to work for a stationary company instead letting him join Feng Hang Tai. He married Sze Cheng-kuah (徐慶月), the daughter of a clerk for a pawnshop and in 1934, his brother in lawZee Swee-fook (徐瑞福) joined him in Singapore where they lived and worked out of shophouse in Cross Street, selling imported goods from China. After a decade of hard work in Singapore, Woo saved enough to start Lea Hin in 1935 in a rented shophouse at 156 South Bridge Road (within a few years it relocated to 231 South Bridge Road). The Chinese name of the firm at the time was “The Lea Hin Company (China Products)” (上海立興國貨公司) as its primary business was distributing products manufactured in Shanghai in the Singaporean and Malay markets. At the time, kerosene-related products such as lanterns and stoves were popular as electricity supplies were not always available or dependable and many street hawkers, fishermen and industrial workers in Singapore bought kerosene lanterns and stoves. 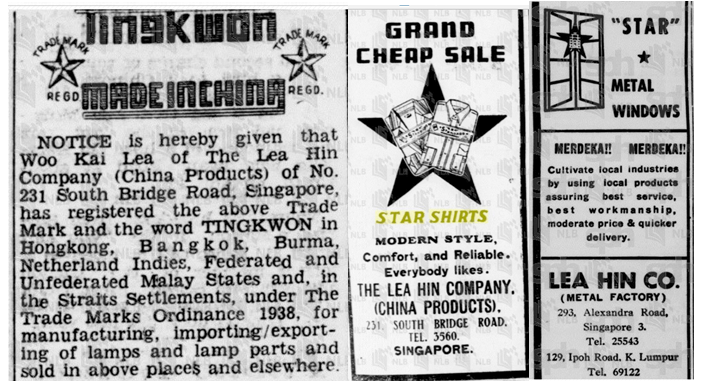 The first brand of lanterns which Lea Hin marketed in Singapore was “Tingkwon” (天光), supplied by the TingkwonGas Lamp factory in Shanghai that has been around since the 1920s which supplied the product. Lea Hin benefited from the increasedpopularity of Chinese made products in overseas Chinese communities after the outbreak of the Sino-Japanese War in 1937 and a branch was established in Shanghai by another brother in law of Woo for procurement of products while Zee Swee-fook traveled extensively in Malaya to promote its products. The Butterfly brand trademark was added in 1939 and in addition to kerosene products it also distributed “Star Shirts”. Old Lea Hin Singapore ad after the War listing a wide variety of products under its Butterfly, Eye and Star brands ranging from furniture, kitchenware, stationary to kerosene stoves and lanterns. When the Japanese occupied Singapore in 1941, Lea Hin came under Japanese military control. After the War, business resumed and in addition to kerosene lamps, Lea Hin began importing kerosene stoves from America and marketed them under the “Butterfly” brand.When the Communists took over Shanghai in 1949, Lea Hin lost its source of supply for kerosene lamps and as a result, the firm set up its ownmetal factory in Singapore at the junction of Alexandra Road and LengKee Road to manufacture lamps. It later ventured into the production of steel casement windows, marketed under the “Star” brand, and supplied them to Housing Development Board projects that required window grilles, roller shutters and aluminum sliding windows. In mid 1950s, Woo Kai-lea established Tingkwon Metal Manufactory Ltd (天光五金製造廠, incorporated in 1955) and Lea Hin Co Ltd (立興企業, incorporated in 1956) in Hong Kong to manufacture kerosene lanterns and stoves for exports to Africa, Australia, Middle East and Southeast Asia. When Aberdeen was developing into an industrial district in the 1960s, the Woo family developed the Woo Kai Lea Industrial Building at 23 Wong Chuk Hang Road in 1967. They also developed Lea Hin Industrial Building (立興工業大廈) at nearby 43 Wong Chuk Hang Road but that building was later sold. In addition to HK, Lea Hin also established branches in Malaysia, Indonesia and Thailand in the 1950s and 1960s and skilled workers from Hong Kong were sent to the various Lea Hin factories across Southeast Asia to ensure quality. According to Made in Hong Kong, Lea Hin had branches in 21 cities in Asia including Rangoon and Timor in the 1950s, a testament to its popularity. Outside of business, Woo Kai Lea was involved in the founding of the Ningpo Guild in Singapore with fellow Ningpo merchants such the movie mogul Run Run Shaw and ran Sam Kiang Huay Kwan, a fraternal organization for Chinese immigrants from the provinces Kiangsu, Chekiang and Kiang-hsi (all three has the character “Kiang”, hence “Sam Kiang” which means three Kiang). In 1977, Woo Kai Lea died of a heart attack while he was in Hong Kong for business. His daughter Woo Siew-wai (胡兆慧) and her husband Stephen Lau (劉漢華) took over the business in HK and established several more companies in HK – including Woo Kai Lea Enterprises and Tingkwon Lamp & Stove Factory Ltd (天光燈爐製造廠), both of which were incorporated in 1977 and Lea Hin Electrical Manufactory (立興電業製造廠), which was incorporated in 1979 and dissolved in 2009. Woo Kai-lea’s son Woo Siew Hin (胡兆興) took over the Singapore business and diversified the company’s business to include epoxy powder for industrial coating application and a range of electrical products marketed under the Farfalla brand. Its “Butterfly” brand kerosene lanterns and stoves are now produced in Indonesia and exported to the African, South Pacific and North American markets. This article was first posted on 12th October 2018. An interesting question. I have no idea I’m afraid why the Made in Hohg Kong is misspelt. I suppose we have to presume it was a lamp that wasn’t inspected properly before being sent out. I think it’s unlikely to make your fortune unlike postage stamp errors, but you never know!